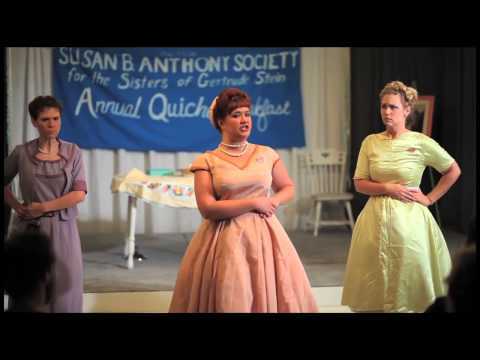 It’s 1956 and The Susan B. Anthony Society for the Sisters of Gertrude Stein are having their annual quiche breakfast. As the assembled “widows” await the announcement of the society's prize-winning quiche, the atomic bomb sirens sound! Has the Communist threat come to pass? How will the “widows” respond as their idyllic town and lifestyle faces attacks? Winner of the 2012 NYC International Fringe Festival as Best Overall Production, 5 Lesbians Eating A Quiche is a tasty recipe of hysterical laughs, sexual innuendoes, unsuccessful repressions, and delicious discoveries. A community center basement. 1956 America. Though Dale and Ginny are the youngest of the five officers, the ladies can vary in age. 5 Lesbians Eating a Quiche was first presented by The New Colony, under Co-Artistic directors Andrew Hobgood and Evan Linder and producing director Will Rogers, at Dank Haus in Chicago, Illinois, on June 24, 2011. It was directed by Sarah Gitenstein. This production was subsequently presented in New York City at the 2012 New York International Fringe Festival, before transferring to the SoHo Playhouse, Off-Broadway, on October 20, 2012.